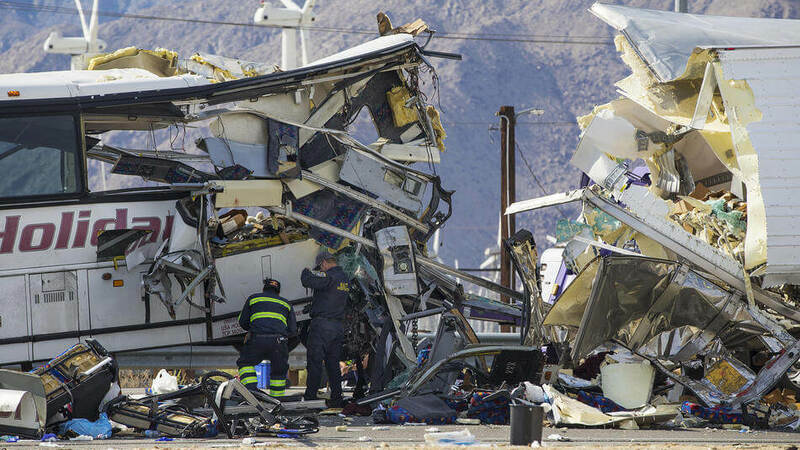 DESERT HOT SPRINGS, Calif. — Just before dawn on Sunday morning, a tour bus full of tourists slammed into the rear end of a tractor-trailer killing 13 passengers, including the driver, and injuring 31 more. Passengers on the tour bus, operated by USA Holiday, had spent the evening at Red Earth Casino near the Salton Sea. They were on their way home on the 10 Freeway to Los Angeles when the bus smashed into the truck’s trailer, crushing the front third of the vehicle. “The speed of the bus was significant that when it hit the back of the big rig… the trailer itself entered about 15 feet into the bus.” California Highway Patrol division Chief Jim Abele clarified in a press conference. The traffic had slowed because of highway work being conducted by Southern California Edison. Traffic control was conducted by the CHP. Abele stated authorities are still investigating why the tour bus was traveling at such a greater speed than the truck. They have yet to determine whether drugs, alcohol, or fatigue played a role in the driver’s failure to avoid or otherwise lessen the severity of the collision. Unfortunately, those answers may be long in coming as the bus, manufactured in 1996, likely did not have a data recorder on board. This technology, standard in newer vehicles, would have recorded the driver’s speed and other data at the time of impact. Survivors of the collision were taken to three hospitals based on triage. Desert Regional Medical Center, the Coachella Valley’s only trauma center, received 14 adult patients. Five of these patients are in critical condition. Two other hospitals received 16 adult patients with reportedly more minor injuries. In the confusion post-accident, some family members struggled to locate their family members. The family of Rosa Ruiz visited three locations before they received news that their grandmother had tragically died in the accident. The deceased, who were mostly women, included the bus driver, Teodulo Vides, 59, as well as Isabel Jimenez Hernandez, 66; Rosa Ruiz, 53; Gustavo Green, 62; Zoila Aguilera, 72; Milagros Gonzales, 72; Conception Corvera, 57; Aracely Tije, 63; Dora Galvez de Rodriguez, 69; Elvia Sanchez, 52, Ana Gomes de Magallon, 71, and Yolanda Mendoza, 69, according to Riverside County coroner’s records. While a 2015 inspection resulted in a satisfactory rating for both coach and driver, previous inspections had resulted in at least six “unsatisfactory” ratings. The driver had also been sued twice for previous accidents, one involving multiple deaths, and received multiple traffic citations for speeding and driving without the appropriate license. The alarming number of tour bus crashes in California raises questions about oversight and safety ratings. In August of this year, four people died and two dozen others injured when their tour bus collided with a sign pole in Merced County. Two years ago, another bus crashed on California’s I-10 after a tractor-trailer spilled a load of steel pipes onto the freeway. Four people died when the bus swerved and overturned in the driver’s attempt to dodge the catastrophe. These and similar crashes have inspired special California bus-based laws. This includes provisions for the CHP to increase the number of tour bus inspections they perform each year and for enhanced safety equipment in buses manufactured post-2020. It’s not clear if the bus had seat belts available for use. Many buses, including school buses, do not have seat belts installed. It is also unclear whether the condition of the road or lack of lighting played a part in the accident. If you or your family have been injured in a bus accident, please contact our office today for a free case evaluation. We have the expertise, compassion, and determination needed to win your case, and have obtained multi-million dollar settlements for previous clients. Our previous results include: a case where a pedestrian was struck by a bus while crossing the street that settled for $3.8 million. We have also won a $3 million settlement after our client’s husband was killed in a bus accident, and a $2 million settlement for our client who was seriously injured while driving a bus.